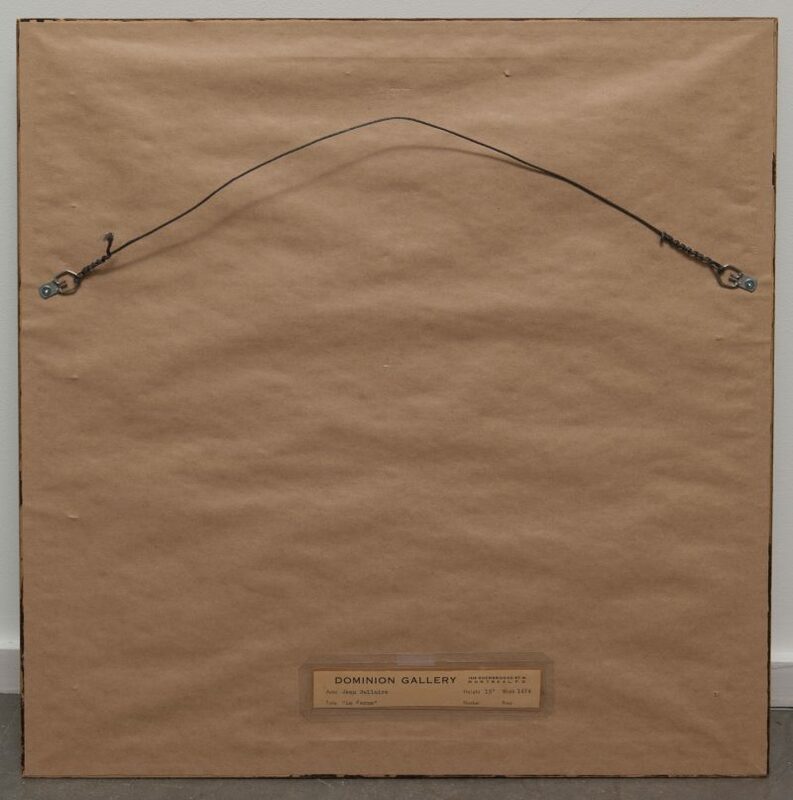 From 1946 to 1952, Jean Dallaire taught painting at the École des beaux-arts in Quebec City and exhibited at the Cercle universitaire de Montréal and the Musée de la Province de Québec (today the Musée national des beaux-arts du Québec). In 1951, he created his largest mural, Québec sous le Régime français, commissioned by the insurance company Industrial Alliance. That same year, Dallaire presented four works in the Concours artistiques de la province de Québec, including Françoise lisant and Nature morte aux poissons, which tied for fourth place. 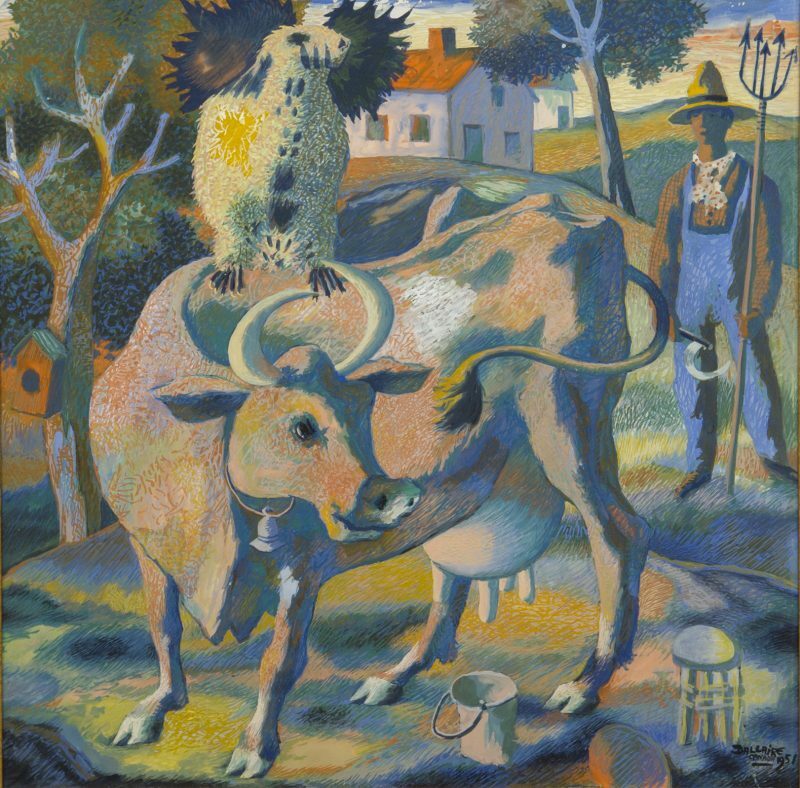 La ferme, also painted that year, epitomizes the tempura technique refined by Dallaire over the years, with its delicate, assured pointillist and expressionistic effects. Here, the artist favours a pastel palette, while still employing vivid chromatic contrasts in certain places. The three-quarter perspective and deep depth of field allows the gaze to navigate easily between elements. Dominating the bold composition, the cyclopean cow occupies most of the painting’s surface in a spiraling figura serpentinata pose accentuated by horns and tail. A pose typically used in portraying human figures, its usual pyramid effect is inverted here, emphasizing the beast’s backbone. Meanwhile, the farmer adopts a light contrapposto stance, resting his weight upon his right leg. Bearing a sickle and pitchfork and wearing overalls, a scarf, and a straw hat, with a confused gaze he seems to pantomime a scarecrow in this whimsical scene. The chimeric animal perched on the cow’s shoulders, with its black eye and lifeless expression, suggests either a protective or evil spirit, perhaps a ghost. A powerful masterwork, La ferme occupies a key place in this artist’s body of work. GRANDBOIS, Michèle. Dallaire, Québec, Musée du Québec, 1999, 253 p.
ROBERT, Guy. Dallaire ou l’oeil panique, Montréal, France-Amérique, 1980, 263 p.